This is part of an on-going series highlighting the Marksmen season-long partners. FAYETTEVILLE, N.C. – When it comes to Cumberland County, there’s no shortage of business, franchises, and organizations owned by active duty military or veterans. 22 Klicks isn’t just veteran-owned – but entirely military themed, right down to the name. A “Klick” became a heavily-used unit of measurement during the wars of the 20th Century. A Klick equals to one kilometer, and “22 klicks” away from the restaurant is Fort Bragg. 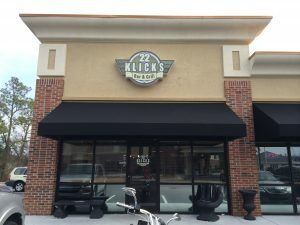 Located in Hope Mills off of N. Main Street, 22 Klicks embraces what makes this community so great, and that’s the ever-lasting presence of the military in the community. 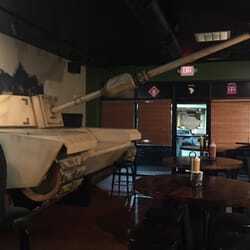 From the draping of the American Flag, to a U.S. Army Tank bursting out of the side wall, there’s no shortage of military familiarity. The Marksmen and 22 Klicks partnered up this year to present our affordable and fun Fayetteville Four Pack. With the Fayetteville Four Pack, fans receive tickets to four great Marksmen games and a $10 gift card to 22 Klicks. You can purchase your own Fayetteville Four Pack here. The restaurant may sound familiar even to those who have never been to Hope Mills or the Fayetteville-area, and that’s because of its claim to fame on the popular television program Bar Rescue. Founded in 2009 as “Cliques”, the restaurant was an immediate hit, but soon found hard times. Following their feature on the show, they re-branded to 22 Klicks and focused solely on the military theme. They’ve proven to be one of the success stories of the show, as 22 Klicks brings in a heavy mix of locals, military, and fans of the show passing through North Carolina. 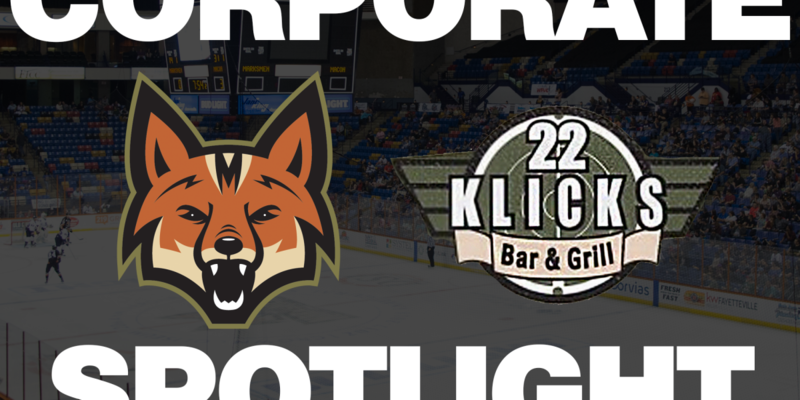 The Markmen organization is proud to have 22 Klicks as a partner for the 2018-19 season, and to be able to bring together two organizations heavily involved in the military community. For more information on upcoming events, specials, and to contact, head to their Facebook Page.